Luciano Pavarotti, whose vibrant high C's and ebullient showmanship made him one of the world's most beloved tenors, has died. He was 71. His manager, Terri Robson, told the AP in an e-mail statement that Pavarotti died at his home in Modena, Italy, at 5 a.m. local time. 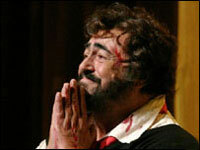 Pavarotti had been diagnosed with pancreatic cancer last year and underwent further treatment in August. The tenor, who seemed equally at ease singing with soprano Joan Sutherland as with the Spice Girls, scoffed at accusations that he was sacrificing his art in favor of commercialism. In the annals of that rare and coddled breed, the operatic tenor, it may well be said the 20th century began with Enrico Caruso and ended with Pavarotti. Other tenors - Domingo included - may have drawn more praise from critics for their artistic range and insights, but none could equal the combination of natural talent and personal charm that so endeared him to audiences, the AP reports. On Wednesday morning, Pavarotti had expressed his "emotion" following the establishment of a "cultural excellence" prize in Italy that he had been the first to receive. He said he was "full of emotion and gratitude ... because it gives me the opportunity to continue to celebrate the magic of a life spent in service of art." Pavarotti broke into the world of opera when he won the top prize in a competition in 1961, for which he was rewarded with the role of Rodolphe in Puccini's "La Boheme" in nearby Reggio Emilia. He went on to perform across Europe before crossing the Atlantic in February 1965 for a production of Donizetti's "Lucia di Lammermoor" in Miami, Florida, with Joan Sutherland as Lucia. It was with Sutherland in February 1972 that Pavarotti truly came of age, taking Covent Garden and the New York Metropolitan Opera by storm with a sparkling production of another Donizetti favourite, "La Fille du Regiment". But he managed to shock purists with his appearances in live concerts, sometimes alongside pop musicians. In 1991 a crowd of 150,000, including the Prince and Princess of Wales, braved the rain and cold in London's Hyde Park to hear him sing. The previous year Pavarotti had hit an even wider audience, when his performance of the aria "Nessun Dorma", from Puccini's "Turandot," was chosen as the theme music for the 1990 Football World Cup, hosted by his native Italy. Among his best-known initiatives in recent years have been his appearances with two other leading singers, Jose Carreras and Placido Domingo, as the "Three Tenors", and the annual "Pavarotti and Friends" concerts in Modena. Pavarotti's success also attracted the attention of the society columns. In 1996 he left his wife Adua after 35 years of marriage and three grown-up daughters for his secretary Nicoletta Mantovani, whom he married in 2003, and with whom he had one child, the AFP reports.